Take simple steps to reduce energy use and save money. Did you know that most of the energy we use in our homes comes from burning fossil fuels? Burning these fossil fuels causes air pollution and contributes to many environmental harming effects like smog, global warming, and the endangerment of wildlife and plants. In addition to reducing the amount of pollution your home produces, there are lots of reasons to be mindful of the energy efficiency quality in your home. If you’re concerned that your cooling or heating system is not working efficiently, looking to save money on utility bills, interested in green technologies, or looking to increase the value of your home then these energy efficiency tips could be very helpful. By following some of the steps below, you can reduce your amount of greenhouse gas emissions and save money in the process! Air conditioners use a ton of electricity, especially when you’re trying to keep cool in warmer months. If you don’t already have them, install celling fans in the largest room of your house, which will allow you to lower your air conditioner several degrees. Be sure to turn your air conditioner up when you leave the house and remember to turn it off completely if you’re leaving for an extended period of time. As for your water heater, you can try experimenting with the temperature to find a lower setting that still feels comfortable to you. Running it at a higher temperature not only wastes energy but also will shorten the life of the tank. A rule of thumb is that it shouldn’t be higher than 120 degree Fahrenheit. If you’re building a new home or looking to replace your current tank, consider a tankless water heater. They can save your overall cost of heating water. You can also set a timer on your water tank and install a programmable thermostat to make things easier with your cooling and heating devices. Replacing light bulbs may seem like a small action, but it all adds up in the long run. Replace standard bulbs with compact fluorescent light bulbs for better energy efficiency, plus they don’t get as hot to the touch. If you prefer lighting on the outside of your home, consider installing motion-detecting lights to conserve power. You could even use timers to turn lights on and off while you’re away. The biggest energy hogging appliance in your house is most likely the fridge or freezer. If you have a relatively old refrigerator, you can compare how many kilowatts per hour (KWH) of electricity your current unit is using to a newer model’s to determine the amount of savings you could receive by replacing it. 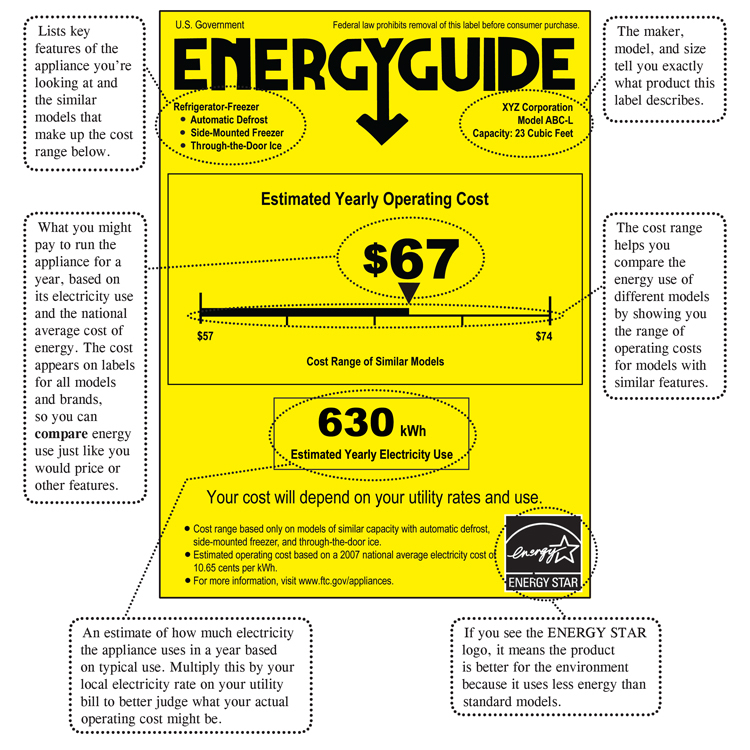 Look for appliances with the yellow energy sticker below. Energy Star is the symbol for energy efficiency created by the U.S. Environmental Protection Agency and the U.S. Department of Energy to help consumers save money and minimize air pollution. An appliance receives the Energy Star rating if it is significantly more energy efficient than the minimum government standards. Other big users of energy include the dishwasher, stovetops, and washer/dryers. Be conscious of how much you use each of these appliances and try cutting back to conserve energy. Make it a family effort to see how everyone can conserve and come up more efficient ways to get chores done. If your roof isn’t properly insulated, your heating and cooling systems are going to be working overtime, using a ton of energy. If you feel like your home is difficult to heat or cool down, you may want to have a professional to conduct a home energy audit (we’ll talk more about this below) to determine if your roof is adequately insulated. Speaking of roofs, you could also go the extra step and start producing your own clean, free, sustainable energy with a residential solar power system. Solar panel installation allows you to harness free energy from the sun and convert it into usable electricity to power your home. Most homeowners who install solar panels chose to connect their systems to the utility grid to use power from traditional sources if needed and to send unused power they generate back into the grid for credit on their utility bills. This is the ultimate home improvement, as it increases the value of your home and will be a huge bonus if and when you decide to move. Solar power not only allows homeowners to cut back drastically on their utility bills, but also largely reduces their use of fossil fuels. You can use our solar power calculator to determine exactly how much you can save with solar power, depending upon you home, location, and other factors. Or get pricing information from local solar power installers for their expert advice by using the form below. If you want to know exactly where you’re wasting energy at home before tackling these projects, you may want to have a home energy audit. In doing so, a professional in simply come to your home and evaluate your energy use and the overall efficiency of the structure. The evaluation generally takes between 2 and 4 hours during which the auditor will review every inch of your home and run a series of tests to determine where improvements can be made. If you’re battling any water or moisture buildup, drafts, or inefficient heating or cooling, we definitely recommend have an energy evaluation. We provide access to multiple local, fully licensed energy evaluators in your area. This may seem like a long list, but just remember that every step you take toward reducing your energy consumption counts!